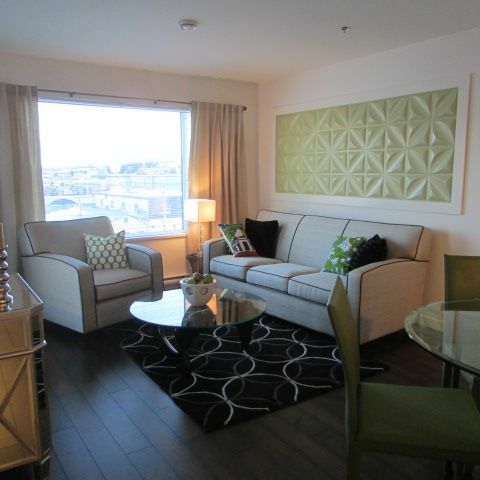 Modern and bright new 2 bedroom, 2 bath corner unit condominium on the 4th floor. Great view of the Yukon river from all windows. Queen bed and a double Murphy bed will fit 3-4 people. One full bath with oval soaker, and other bath has 5' shower. There is an office as well with wireless internet. Kitchen is fully equipped. Private deck, elevator, cable tv, underground parking. No pets, no smoking please. I am a realtor in Whitehorse, and am the listing agent for this condominium project. Whitehorse has been home for me for 26 years and I love it! I bought and furnished this suite as I think it is a great base for vacationers or guests coming into work for a week or two at a time. If I was vacationing in Whitehorse, I would love to stay in a home that was new, bright, with all the amenities to keep me comfortable. This property is right downtown by the river and you can walk easily to grocery stores, main street shopping, restaurants if you don't want to cook, waterfront walking trail half block away. If you like mountain and riverviews, you will enjoy your stay at this property. During New Years you have one of the best views of the fireworks from your deck and can watch the Yukon Quest dogteams pass by on the frozen river. The kitchen is a full kitchen and well equipped. Very comfortable beds, great linens and hairdryer in bathrooms, ironing board and iron. Unit is very quiet. There is underground parking, elevator. If you want the comforts of home, you will have it here. Ensuite bathroom has an oval soaker tub and shower combination. Storage cabinet has towels, hair dryer, cottonballs, Q-tips available and overnight kit in case you forgot to pack your toothbrush and mouthwash etc. The ensuite bathroom has a vessel sink. Located in the heart of downtown. Don't really need a car if you want to walk to shops, banks, restaurants and waterfront. Views of Grey Mountain and Mount Sima. Right by the Yukon River, the hub during the Yukon Gold Rush. Each room is heated separately with electric baseboard heat. Laminate flooring throughout apartment with two area carpets. Access to private deck from living room. Counterdepth model with freezer on the bottom. Ceran top stove, easy clean feature. Coffee filters, S&P, some herbs. Blender, storage containers, dishsoap, laundry soap. Fully equipped with stainless steel appliances, Caesarstone (quartz) countertops in kitchen and both bathrooms. Small balcony with 2 deck chairs and table, river and mountain views. There are 2 rental places for Kayak/canoe rental. They provide drop off and pick up locations. Although this apartment is wheel chair accessible, the entry is a bit tight for a wheelchair, and the ensuite bathroom entry is tight. Not a senior adult community, however, there are many seniors owning and living full time in this condo complex. Thank you for the lovely review! I am so glad you feel comfortable and love your stay in my condo each time you come here at Christmas. Happy to be part of your holiday stay. If you are looking for a lovely quiet clean suite in Whitehorse to rent then this is the unit. It comes all equipped and the owner is amazing to deal with. The bed is comfortable and the kitchen and living room has everything you need to enjoy your stay. I am so glad you enjoyed the condo and your time in Whitehorse. Hope to see you again soon! We had a great time at the condo. It was so clean and modern. It was small but spacious and we had room to spread out. It had everything we needed and was close to everything that we were doing during our trip. The kitchen was well stocked and the parking was a plus. We will be staying here again in the future for our next trip. Thank you again for such a great place and the breakfast food for us in the morning after such a long travel day and getting stuck on the ferry. This rental won’t disappoint in anyway. The owner is amazing and so is the condo! I am glad the location and amenities worked out for your family. Hope to see you next year! Great space. Had everything we needed for our five night stay. Very comfortable beds and well equipped kitchen. Felt like home away from home. Glad you felt right at home! You're most welcome to come for another stay anytime. 4 of us had a great stay at the condo. The location is right downtown, and makes lots of things within walking distance. The condo itself is perfect for two couples as it has 2 bedrooms and 2 bathrooms in a nice layout giving everyone their own space. The kitchen has everything you could ever need for cooking which makes preparing meals there easy. Marilyn has not overlooked any detail which makes for a pleasant stay. I'm so glad you had a great stay in my condo and in Whitehorse. Come back again! The apartment was roomy, beautifully decorated, comfortable and a pleasure to live in. It was exceptionally clean, and the kitchen had everything we needed. The apartment is downtown, and steps away from the Yukon River and a couple blocks from restaurants and shopping but still very quiet at night (in the building and on the street). Marilyn was a responsive and helpful host. It was the best rental we have had so far, and I would definitely recommend this property to anyone considering a vacation in Whitehorse. Thank you for your compliments and comments. So glad you enjoyed the condo and I hope to see you back!